Dechel: Over 10 years ago I got my start as a stylist. I was on track to become a doctor and I was like I’m gonna take a year off and I never went to medical school. After I graduated from UCLA, I just needed a break. At the time, I was working at a small boutique in Venice. I was doing everything: the visual merchandising, the buying, and helping customers. I was like "I can open a boutique one day." Fast forward, during that break, I went to take a fashion merchandising class just to take it. The teacher also taught at Cal State Northridge. She offered me an opportunity to go on a three-month long European fashion tour and that was all about design and merchandising. I was just like this is fashion.. I saw every aspect of it. I think that’s what really got me going into thinking I can do a career in fashion. As before, I never thought of it as a possibility because I didn’t know much about it. Then, I started my own online vintage store, where it was thrifting and shooting stuff on models. From that, so many different opportunities came. I ended up styling a local band from LA, Jake Davie, because I was literally going to all of the shows. Me and my best friend. And they were like, 'Hey can you style us with your vintage things?' And that’s how I kinda really fell into it. From the online vintage store, I was like 'Okay, I have a knack for styling'. That was my first job and from that I met a costume designer, Marco Marco, who does so many celebrities. He has such a great list of every musician you can ever imagine. I just met him and became friends. I remember one night he texted me, “Hey would you wanna go on tour for me?” I was like I have no idea what that means and it was like 12 am. I was like, "Okay, but we can chat about it maybe before I say yes" but I was like sure. From there, I went on tour with Lil Wayne and started styling. That was in 2009. So that’s when he put out his first big album, the Carter Three, and he was doing his first set of arena tours. That was actually like a big tour to go on. But it was still small enough, where everybody was doing it for the first time. From there I met Nicki Minaj and Drake, who I ended up working with on an off tour. That following year, I went on a world tour with the Black Eyed Peas. We ended up dressing them for everything that was on tour. It was mostly the costume designing that I was partnering with Marco with. And then when then have everything around the world from press to red carpet, we were styling their looks for them. That carried on for the following 3 to 4 years and I was just like I don’t want to be on tour anymore. I look back now and I was always gone. I was literally living out of a suitcase even being in LA because you have a month off and then it’s like ok, you gotta go. I had no stability but I built a clientele in LA, mostly musicians. But I really did everything. So my background ranged from stage design, to merchandise and product design. And that kept me busy and traveling just as much but I just craved a slower lifestyle. And I was like ok, I want to go to one company basically that I can style, and really shine there, but that has a bigger social mission. And that place was Reformation who I interviewed with cause they're like one of the only company’s here in LA that was sustainable with a good aesthetic. That was really important for me too. Went through this whole interview process with them where I produced a photo shoot, mood boards, casting models, like this whole thing. And didn’t get hired by them. Which like for me that was ok. But maybe three weeks following I saw so much of my inspiration on their new website relaunch. Like from my mood board inspiration. So, I would never be like they stole my ideas just for that. But then they asked me who the model was that I use and what was her information and that they eventually wanted to use her for their shoots. For me, that there was drawing the line because that’s what I got paid to do. I think that I always mention this as part of my story. One because it’s what got me to found to Galerie LA. But also, for many young people in fashion that there’s a lot of poaching going on. They should be aware of how you share your ideas and things. I met a girl named Stephanie at the same time who coincidentally was going through the reformation interview process. She had a background in sustainable fashion. And so she was like a sustainable driven person. And she had the same exact experience that I did. And I randomly met her at a volunteer opportunity for dress for success. So this is how we dreamt up Galerie LA. We wanted to bring together emerging brands with a sustainable ethos and mission as well as like integrating in the concept stores that we loved from Dover Street Market to Opening Ceremony where you come in and everything is like a work of art. That’s really what we dreamt up. We treated our business plan like it was doing our thesis. We researched brands for about three months. Everything was so perfectly thought out but she ended up moving back to Europe. So I was just like, 'Do I do this or do I not do this?' I was going for it. This is the coolest thing. So the following year in 2015 was when we launched as a blog. We were just highlighting brands, literally from anywhere that were fashionable and have a sustainable production method. In 2016, we launched the e-commerce store, and another curated collection the following year. In 2017, we opened up a pop up here and then moved in January. That's pretty much the timeline of Galerie LA. 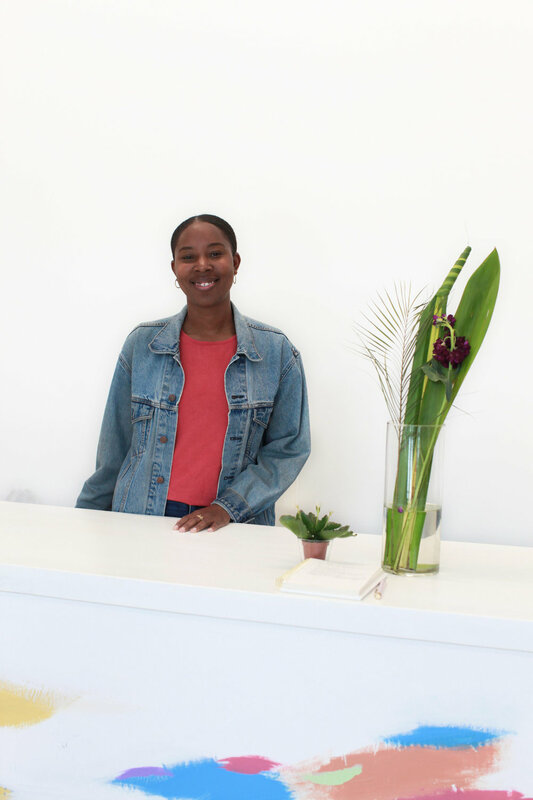 So excited to finally share this interview with Dechel McKillian, the founder of Galerie LA, a Los Angeles based retailer located at The Row in Downtown LA carrying sustainable and ethical brands. As a former fashion designer, I have strived to be conscious and ethical in producing my fashion collections. I would recommend watching the True Cost if you haven't already. It's disheartening to learn how the fashion industry is not only the leading polluter of the earth, but the cost of mass-producing fashion pieces negatively impacts the lives of those creating clothing in factories overseas. Thankfully, in recent years, there has been a growing collective awakening and shift to produce fashion pieces more ethically. Most conscious brands I know are online. 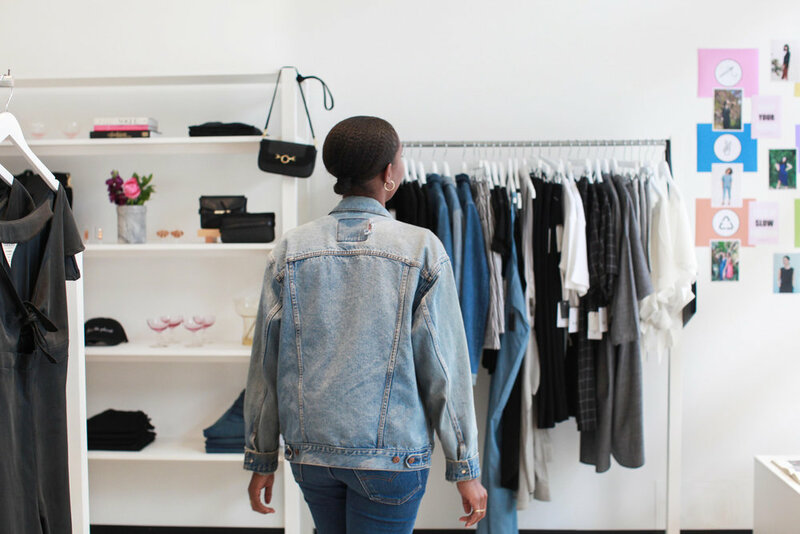 So visiting a physical space like Galerie LA earlier this year that houses apparel and accessories was a refreshing and tangible experience. I sat down with Dechel on a Sunday, to discuss her fashion journey from pre-med to styling for Lil Wayne, Nicki Minaj, Drake and the Black Eye Peas. We also discussed shifts in the fashion industry and how she went from online shop owner into a brick-and-mortar owner creating community. Since starting Galerie LA, what shifts have you seen in the industry? Dechel: As you may know, designers present their stuff on the seasonal calendar and retailers buy into those garments. In the last three to five years, from trade shows in Vegas to Los Angeles to Europe, it's been quiet. Buyers are not placing orders with brands at these shows. So, it makes sense that designers are not wanting to pay thousands of dollars to be at these trade shows anymore. They are now taking their collections and offering them directly to consumers. Although designers are still doing wholesale, they are figuring out 'How do we boost our strategy to get in front of our customers?' Even more, so that I think has changed is there are more sales channels that offer designers the terms they are looking for like with Garmentory. Galerie LA is like one of those sales channels where brands don't have to overproduce just to meet the wholesale minimums. Sometimes if stores don't sell inventory, they end up sending it back to the brands at some point. Some brands even have to pay the retailers if they put their things on sale. There are so many terms like that. The big department stores, they’re terrible. So I think, even that is changing. And the big retailers are also rethinking their strategy. We have all these brick and mortar stores and they’re filled with tons of inventory and now it’s not selling. Because people are either shopping directly with the brands online or they’re just looking for different experiences than going into a mall doesn’t offer what they want. People are looking for experiences. I think if they are going to spend their dollars, they want to meet the designer in person and I want like a glass of champagne. They want personal styling services and want to interact. The big box retailers are trying to catch up to that. Where small brands and retailers have more control to offer people and get that feedback. So I think that’s just a small bit of how things are changing and let’s not even get into the digital media side of it! Kristine: Yes. It’s so interesting because I work with so many brands on the digital side of things but I’m an in-person shopper. I don’t know if it’s because of the former designer in me, who likes to feel and see things in-person. So my burning question is, what lead you to open this brick and mortar knowing all this? Dechel: Exactly! It’s like you wake up to this retail apocalypse and then opening a store like this doesn’t make any sense. For me, Galerie LA had been online for two spring seasons right when we launched the e-commerce store. It was doing well, we had a great following online and great engagement from people who were following the sustainable fashion movement. 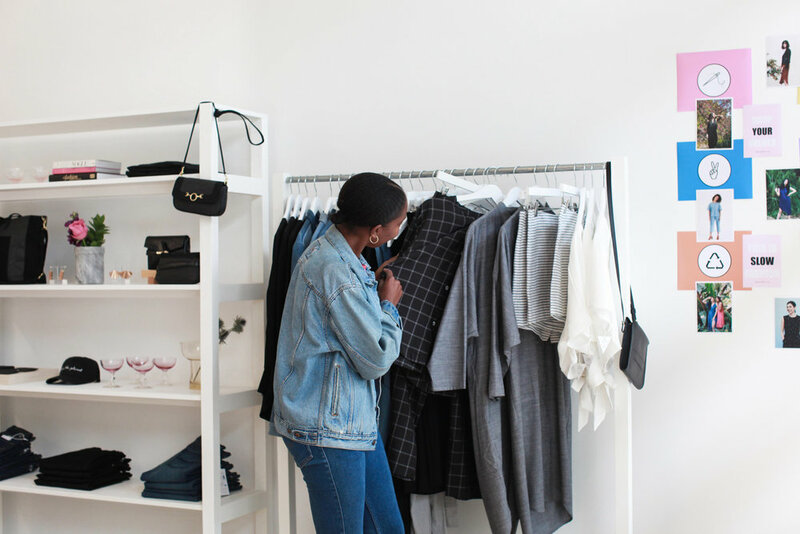 I think in order for sustainable fashion to grow, you need to be able to see, feel, and touch the clothes and to also reach a wide demographic of people that might not find you online. So, I’m not paying thousands a month for Google ad words just to pop-up online. I chose to be in a high traffic space, so people that are looking for sustainable fashions can find us. Anyone who walks in that will like the clothes and hear about brands in the store may open their mind to start shopping this way. For me, it was like a two-fold process, definitely a lot faster than I wanted. I think it’s just so important to have a physical presence, and then we do tons of different events like, having panel discussions, bringing people together so that we can spread a bigger awareness about sustainable fashion, and then also just fun events like we had a clothing swap in February. We had mimosas and amazing clothes on the racks. From that, so many women were exchanging numbers and asking “What do you do?” in a way to build community. I think that is something I didn’t anticipate was going to happen but that’s totally fluidly happening in the process. Kristine: I love the fact that you touch on experience. It’s so important because in the digital space, everyone’s more conscious of trying to be authentic and connecting with their audience. But to experience something in-person, that’s what we’re trying to do. Not just in business, in life. We’re all just seeking connection. So it’s amazing that you’ve created this and have fluidly turned it into a gathering space. 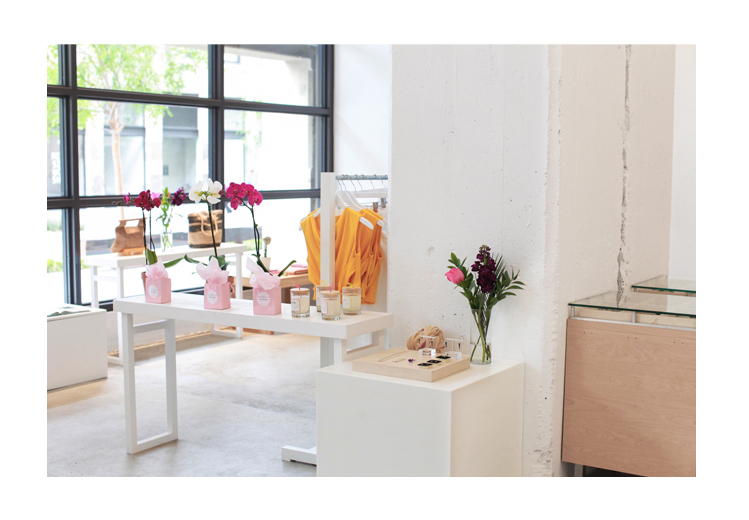 The intention of Galerie LA is to be the number one one-stop shop for sustainable fashion. We want to house as many sustainable brands that we can provide that transparency for our customers too. We say that our batch system allows women to 'shop their values'. Which is why we sync our shop by your values. Because some things mean more to others. Maybe it’s local production or maybe its becoming vegan. I really value finding products that are made a certain way or I want more social impact on things that give back. Whatever it is, you can kinda just start somewhere. Often, when people think about sustainability, you’ll see the True Cost and think 'I can’t shop anywhere now!' So, if we can just start small, I think that it begins a lifestyle change. No one is changing their life overnight. Some people do, but that’s very rare. It’s the same thing with fashion. I think that’s a greater way to get towards the sustainable wardrobe and just being more conscious. Eventually more people will become aware. Which is you know, a good and bad thing. The H&M’s, the ZARA’s all have conscious collections now. But even H&M backed out of their agreement to pay fair wages. So it’s such a tug and pull. They are doing this, but just to make more dollars. The people who are making those clothing are barely living to make clothes for us. For me, it all becomes about transparency. For brands to be transparent, I do get that its so hard to be 100% anything. For H&M, a $40 billion company, to even produce a small conscious collection still takes a lot. But they still could be doing more and more. I always compare it to McDonalds that has captured the market in fast food. They now offer vegetarians, a veggie burger. They’re still like 'We’ve gotta get these customers now and offer them something'. So people are becoming more aware, they’ll make their own decisions even if H&M is a gateway for them to shop at another emerging brand because they’re now starting to think that way. I think it’s still good for the environment. But, yeah, I want more transparency. Kristine: It’s so lovely to have this conversation on the fashion industry and having a non-linear career with someone who also shares similar values. Like, you were gonna go to med school and didn’t. Instead ended up in fashion.. it’s amazing! Dechel: I feel like almost all the shop owners have this divergent career, like the pottery girls, one is an architect and now she’s just opening a pottery shop. The wine shop owner is an attorney and is now opening this wine shop. Let’s tell our stories.. it doesn’t have to be one way like we thought. Kristine: Our paths are nonlinear. For me, it was all over the place. I actually went to school for Public Health. I wanted to work for nonprofits to promote health and wellness. I also work with several wellness brands now. So in a way it definitely has become a full circle journey. I definitely learned a lot of things. As you know, education is so important but your career doesn’t have to be exactly what you studied. Dechel: Exactly, for most people its not. That’s awesome we had a very similar start and somehow we both ended up in fashion. How do you define a sustainable brand? Dechel: We created the batch system. Every brand that we carry is ethically made. Brands are usually going directly to the factories or they're making the garments themselves, like in their small studios. That was really important just to have that stand because as a conscious consumer I don’t want my things made in a sweatshop. Everything is ethically made, that’s the number one criteria. It’s really hard for a brand to be 100% sustainable. So that’s why we kinda opened it up. On top of a lot of things being ethically made, a lot of brands use eco-friendly materials. That is such a wide range, but I think they have to go above and beyond to start to source and find those materials just to create great garments. Some brands use artisan made products. So, for example, they are going to specific countries where they’re known for a specific type of weaving or type of beading or something where it is a part of the culture to produce things this way. Then there's locally made. Local from the city or country of origin. It’s not going from China to wherever the brand is based and then shipping it out to LA. Instantly we can reduce that carbon footprint that’s very simple brands made right here in LA which is awesome for a consumer. We want to support our local economy. So we just opened that up for people to know where they’re things are coming from. Recycled materials. A lot of the brands use dead-stock materials. So they’re not even making new fabrics to use and within that so many things are up-cycled. Dead-stock can replace materials that they use to make things. The other criteria is for cruelty-free brands that use all vegan materials eliminating the use of animal products and animal byproducts in their materials and production practices. Grateful to have met another business owner leading with her nature and intent. Sharing video highlights from our interview on Instagram @nature.intent.